Aaron Ramsey will not allow criticism of his Arsenal displays to affect his international form, according to Wales team-mate Hal Robson-Kanu. 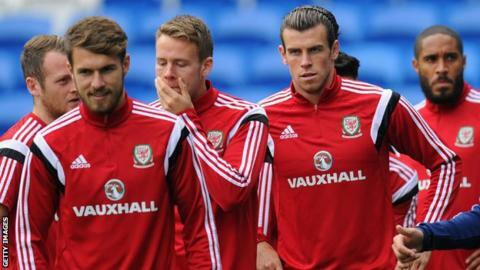 Wales face Belgium in a Euro 2016 qualifier in Brussels on Sunday. Arsenal manager Arsene Wenger told midfielder Ramsay, 23, to "keep his priorities right" after ex-striker Charlie Nicholas said Ramsey was focused on "Hollywood football". "Aaron's a professional and gives 100% week in, week out," said Robson-Kanu. "Whether it's at Arsenal or coming away with Wales, he'll continue to work hard and try and achieve what he's been trying to do this season. "He's a world-class player and we're lucky to have him in the squad along with Gareth Bale, players who can unlock a defence and do things for us." Ramsey was voted Arsenal player of the season after scoring 16 goals, including an FA Cup final winner, during the 2013-14 campaign, but has failed to recapture that form this term. Ramsey scored a late equaliser when an under-strength Wales held Belgium 1-1 in Brussels in October 2013. He was included in the Wales squad after missing the 0-0 draw with Bosnia and the 2-1 win over Cyprus in October with a hamstring injury. Chris Coleman's side lead Group B with seven points from three matches ahead of the meeting with a Belgium team ranked fourth in the world. Robson-Kanu scored the winner against Cyprus and, in the absence of injured strikers Sam Vokes and Simon Church, could feature again in a more central position alongside Real Madrid's Gareth Bale. "We have a few strikers injured but it's a squad effort," Robson-Kanu said. "If we're going to qualify it's not going to be an XI or even a 16. It's going to be a squad and we've got players to fill in and perform in positions. "Over the course of a season I play in a number of positions - up front, on the wing or in behind the striker. "I'm more than comfortable playing where the gaffer decides to play me."